Over the years, I’ve made endless desserts for family gatherings: orange-chocolate bundt cakes, flourless chocolate cakes, chocolate caramel cheesecakes, bourbon-pumpkin cheesecakes, apple pies, peach pies, fruit crisps and crumbles, fresh fruit tarts, lemon bundts, but the only things that our families simply never shut up about in the days, months and years after are those that specialize in cocoa. Thus, for our Hanukah dinner I figured I’d cut out the middle men, so to speak — the flour, the baking powder, fruits and cheese — and just give people the big old pile of chocolate they want, namely in the form of Robert Linxe’s Chocolate Tart in Dorie Greenspan’s wonderful Paris Sweets. Linxe’s chocolate tart is as succinct and potent as you’d expect from a man obsessed with ganache. Unable to find a 6 1/2-inch tart pan anywhere, and lacking interest in scaling the recipe up to the 10-inch size I own, I opted to make wee tartlets out of it in those brioche molds I bought last summer. Alex thinks they look a bit like Stella D’oro Swiss Fudge Cookies, which we both ate as kids, nibbling off the cookie edges, saving the fudgy center for last. I’d advise you to eat these tartlets the same way, or doused in Cheater’s Creme Anglaise (melted vanilla gelato or good-quality ice-cream) or raspberry sauce. The only thing I added to the recipe was a splash of Frangelico because, well, I’m a lush and I’m sure you expect nothing less of me by now. Makes enough for three 9-inch tart crusts. Dorie Greenspan calls this the classic sweet tart dough, which pastry chefs learn as apprentices. More of a cookie dough, it’s used with sweet dessert tarts, and it’s easiest to make in a food processor, if you have one. This was my first time using this recipe (and not Martha Stewart’s version) and I thought the addition of ground almonds was delicious. Though I halved it, I still have quite a bit remaining, which I think I’ll roll out, sprinkle it with coarse sugar and cut it into small cookies. 3. To roll and bake tart crusts: For each tart, butter the right-sized tart pan and place it on a parchment-lined baking sheet. If you are making more than one tart, work with one piece of dough at a time. 5. When you are ready to bake the crust(s), preheat the oven to 350°F (180°C). Line the crust with e circle of parchment paper or foil and fill with dried beans or rice. 6. Bake the crust (or crusts) for 20 to 25 minutes, or just until very lightly colored. If the crust needs to be fully baked, remove the parchment and beans and bake the crust for another 3 to 5 minutes, or until golden. Transfer to a rack to cool. Keeping: Wrapped airtight, the dough can be kept in the refrigerator for up to 2 days or frozen for a month. Frozen disks of dough take 45 to 60 minutes at average room temperature to reach a good rolling-out consistency. Baked crusts can be uncovered at room temperature for about 8 hours. 1. Put the chocolate in a heatproof bowl and keep it close at hand. In a small bowl, beat 1 tablespoon of the heavy cream with the egg yolks just until the eggs are liquid. Check that the butter is soft but not oily. If necessary, either beat it with a rubber spatula to soften it or smear it against the counter under the heel of your hand. Do ahead: The tart is best served at room temperature the day it is made. If you must keep it, refrigerate it over night, then let it stand at room temperature for about 2 hours before serving. You know what would look really nice in those chocolate pictures? A Tiffany necklace. Please describe at least! It’s just wrong that you live 3,000 miles away. these don’t keep? can they be frozen? I’m trying to make christmas goodie baskets but am seriously stalled on what to put in them!! Can we say *swoon*? That thud you heard was me fainting from hormonal delight. I had spied these tasty treats on your flickr page and PRAYED that you would talk about them. Oh what a happy day! Okay…Houston bound am I! I got a fabulous job offer and if they hold true to their preoffer promises, then I will accept. Who would say no to working from home or wearing jeans to the office? Also, the bonus above all bonus, I will be seeing the love of my life on a daily basis. So I really do need to check out Paris Sweets. Wish I had just one. Ooooo! Yummy! I wanted something really special for a cast party and you have absolutely hit the nail on the head! I just hope that I can find all the ingredients here. Also, do you know how to make marshmallow cream? Is it as simple as melting regular marshmallows? We don’t have it here and my mom’s awesome fudge relies on it. I love how intense the filling color is. I think I should add this book to my wish list, I’ve read so many good comments about it. Despite the pounds of sweets I’ve consumed lately, I’m suddenly craving chocolate, because those look absolutely heavenly. I’m thinking I may save the recipe for Valentines day, because they look sinful, and I’ve done my share of sinful eating lately. Oh, not fair! I haven’t had breakfast yet this morning and at sight of these photos, my stomach gave an audible, scary GROWL. Oops, there it goes again. …and all topped off with chocolate covered marzipan! I just made Ina’s hazelnut truffles last weekend (with Frangelico!). If you want truffles, but don’t want to attempt the Linxe version, these were delish. me7c7v – You know, I just wouldn’t file these under treats that would be good frozen or too much later. 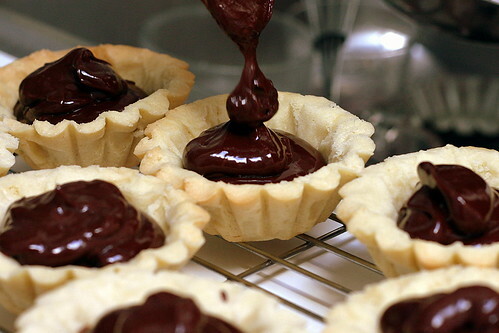 The ganache is really best fresh, and at room temperature, where it is fairly soft. The shells can certainly be made in advance, however. Jenifer – That is SUCH great news! Good for you! Shelly – Nope! I never made marshmallow cream before but it sounds awesome. I do hope to try to make marshmallows very very soon. M – You read my mind! I hope to try to make her hazelnut truffles this week, for practice. (It’s actually why I bought the frangelico in the first place.) I’m so glad you liked them. Those are awesome, and your family’s got it right, chocolate is the way to go. That’s IT!!! Send me your address……I hoppin’ on a plane! Honestly, you would be the first person I would look up if I EVER come to New York!! Oh my…drooooooollll…and just when I thought I was done with holiday baking, out comes this charmer of a recipe! Mmmmmmmmmmmmmmmmm… oh my. Those look fantastic! Creamy, chocolate. Your photos are drool worthy, for sure! The last time I had a Linxe chocolate was 3 years ago in Paris. Completely agree with you that they are to die for. Yum. I could lick those cookies right off the computer. Oh! I’m soooo late with this, but my dear, happy Hanukah to you and yours. And thank you for everything you do. Increasingly, whenever I’m stumped for something to cook or bake, I look to your site. Not only are your recipes wonderful, but your voice is terrific and you’re a joy to read. What a love you are. Thank you. That picture of the dropping chocolate is sheer decadence, how lucky your family members are to have such a loving cook in their midst! OOOOOOOOOOOOO, glossy beautiful chocolate…and so wee…and looks like fun too! omg… just the pix makes me drool. So the recipe you have is for a 9in tart and the chocolate recipe fills a 6in tart. Since I would rather make a large tart, how do you think I should proceed? Should I just double the chocolate filling by a third? Also, do you think this would taste good as a large tart? Would it be hard to serve in large slices with the ganache soft? Would it taste good with some fresh fruit on top? Hi Maytal–I think doing the 1.5 thing would work. I’ve only made it this way, so I can’t even verify that the volume isn’t way too much for 6″ anyhow, but nonetheless, even if there is extra I personally don’t know anyone who would complain. It is a little soft. I’m not sure how that work work for larger-than-6″ slices, but, well, even if it’s messy it will still be crazy delicious. I bet some raspberries on top would be awesome, but I’d plop them on right before I served it. Sorry I can’t give you more of a definitive answer! I made this pastry last night and swoon, easily the best tart pastry I have ever had :D Thanks. is there any need to actually *bake* these cookies? I mean…I could probably just eat the dough…. And nobody has to know, right? In a small bowl, beat 1 tablespoon over the heavy cream with the egg yolks just until the eggs are liquid. Over should be “of”. Fixed now. I’m making this for a family dinner along with roast chicken, mashed potatoes and salad. Trader Joe’s was out of heavy cream. Are you going to make a Minnesota girl go back out into the freezing tundra to buy more, or will half and half work? It won’t work the same. But there’s no reason not to try it. i wonder which you would recommend i use- this one or the one for robert linxe’s? Tamara — Absolutley. That one shrunk terribly on me (I think I warned of this in the post, or at least hope I did!) As for Greenspan, I suspect she has a few tart shells up her sleeve. That said, Paris Sweets is her editing of other chef’s recipes, so that would explain why it is different. Paris Sweets is a tour of Paris patisseries, through recipes they’ve provided. If I were to substitute vanilla extract for the vanilla bean, about how much do you think I should use? Just wondering. Thanks! Would the dough taste the same with margarine instead of butter? Or would I be able to mix by hand? My food processor (which I adore and use all the time) is pareve. Also, I second Greta’s question from May: can we substitute vanilla extract for vanilla bean? I love you so much for the comment about “Cheater’s Creme Anglaise.” Every time I have read the recipe for Creme Anglaise I have wondered whether I could substitute melted vanilla ice cream, but always chickened out (from both the Anglaise and the ice cream trick). Love the blog, thanks for the great recipes and commentary! Looking forward to your book! Butter in room temperature??? Shouldn’t it be VERY COLD???? Mia — It doesn’t need to be. But, since you’re using the food processor, you can probably have it cold as well without any problem. Working on making this. Made the three doughs last night and rolled one out today. It came out of the fridge rock hard but eventually I got it rolled out and pressed into a 9 inch pyrex pie dish. I was confused about why I’d need to put parchment paper onto a baking sheet, but maybe it’s because I don’t have to correct pastry pan or something. I cut the circle of parchment paper out and put it into the crust and filled the pan with rice–unfortunately the rice stuck to the edges of the pan so I guess I’ll have to cut out the edges. I did chill it 30 minutes and everything. After I poured off the rice that wasn’t stuck, and baked it to fully bake it, the bottom puffed up but I think it’s ok. Maybe I underbaked it because it seems a little raw but the edges were golden brown. Finally, someone who understands my love affair with La Maison du Chocolat! I think I spent 50 dollars on chocolate a month ago there and ate it all in two days. Just livin’ on the edge. No regrets, whatsoever. Also, i noticed that the recipe for the pate sucree is exactly the same as the one in Desserts by Pierre Herme… Also be Doris Greenspan. Probably being the reason why. My sister use to visit a holistic doctor in Brittany, France and on her way home via Paris, woud bring me chocolates from La Maison du Chocolat. They were heaven! She is no longer with us but this lovely recipe I will make and I think it will live up to the standards of Robert with the right chocolate. Thanks Deb! This was delicious. It was good right when I made it, but my husband and I liked it better after it had been in the fridge, served cold. I wasn’t sure how it would keep, but it stays excellent in the fridge for a few days. Oh no i think i overworked my dough… the dough now looks more like buscuit dough instead of rollable pie dough. Is there anyway i could save it.